We escaped relatively unscathed when O was teething. Apart from an odd day here or there his first teeth appeared without too much fuss. Obviously I had bought a rather well known giraffe to help him through the teething pain but it was never really needed. G is a completely different baby to my eldest, they always say you don’t get two the same, and my boys are living proof of this. G is a lot more vocal than O ever was and I feared teething would not be the mild experience we had had five years earlier. Like his brother G was a late teether and despite thinking he was on the verge of getting his first tooth for months there remained no sign of them. 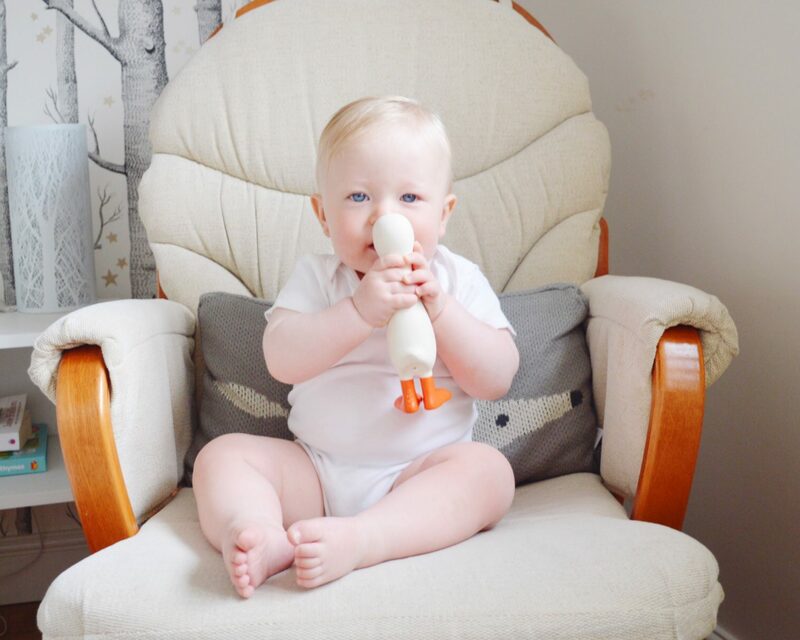 We were offered the opportunity to review the new teething toy Gertie The Good Goose and I was of the opinion, the more help we could have the better. 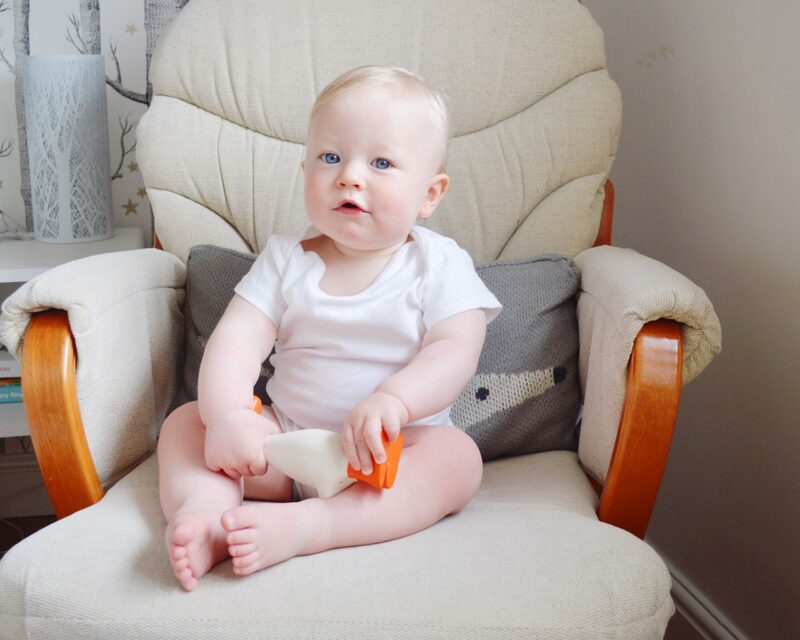 Gertie has been expertly sized to fit perfectly in babies’ hands and to soothe tender gums. 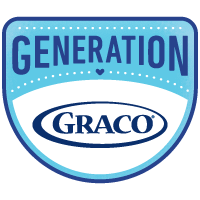 Your baby’s teething phase may be a long, and potentially difficult, time to manage. Gertie can lend her feet, her tail feathers, and her beak to your baby for pain relief and often even giggles. 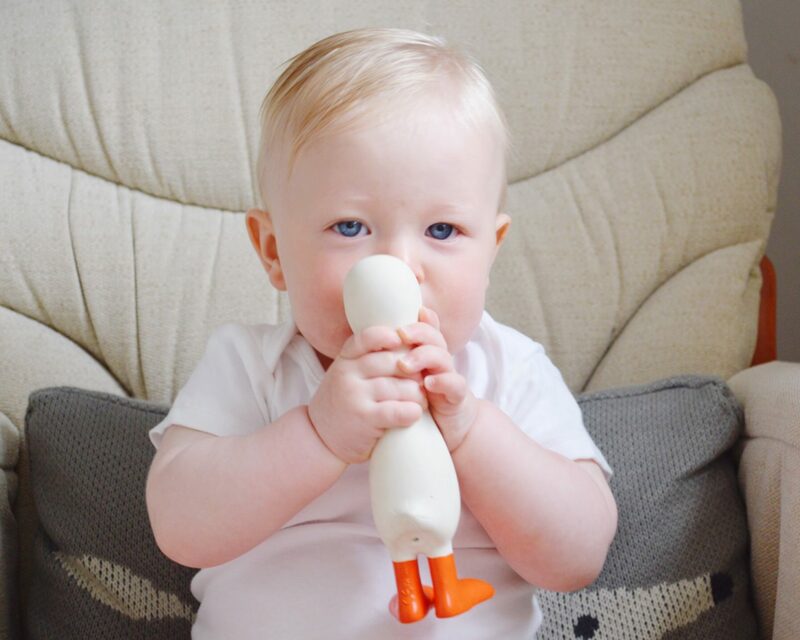 Gertie has a lovely quack (more of a squeak) that your baby will soon identify as their special toy’s magical sound. 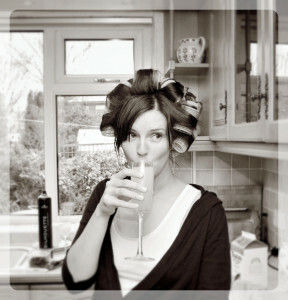 She is soft to the touch, has a slight vanilla scent, and has contrasting colours for a quick and easy visual focus. 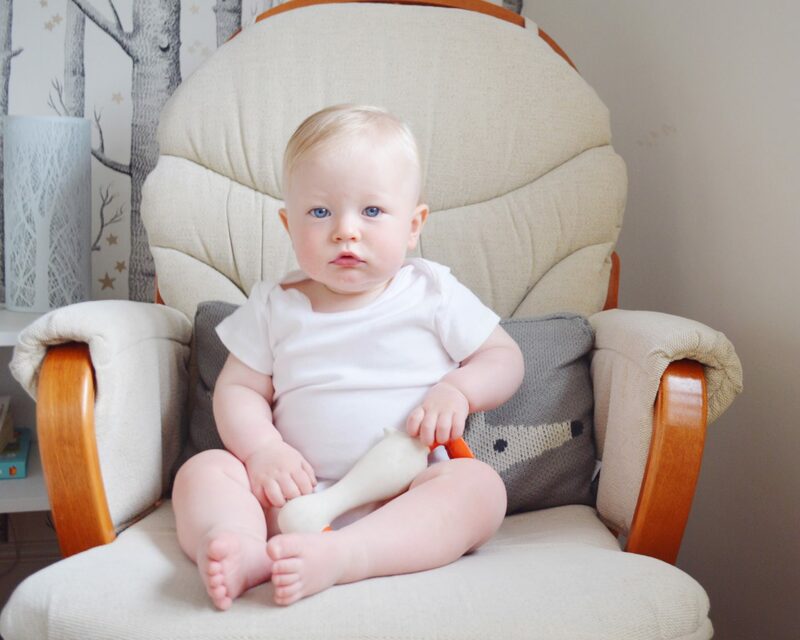 Gertie is soft and light, and the simple contours make her incredibly easy for your baby to grasp and manipulate freely. So what did G make of her? I always think that G doesn’t suffer fools gladly, from day one he has been very clear at communicating what he likes and dislikes. Whilst he is a very smiley baby he does have a death stare if someone isn’t impressing him and he will be the first to throw away a toy if he doesn’t like it. Luckily we didn’t have that problem with Gertie. She is really easy for him to hold, and he usually does this with two hands as he chomps on her beak with all his strength. I like the fact it is small and light enough to go into the changing bag without it feeling like something else to weigh me down. Plus on a practical note it is very easy to clean, essential when it is designed to be spending a lot of time in your baby’s mouth. One of the lovely things about being a mum of two is watching the bond grown between your children and O liked Gertie as much as G did, possibly a little too much as he kept snatching it off him. It has become a toy they share to some extent as O squeaks it for G and makes her dance for him to laugh at. 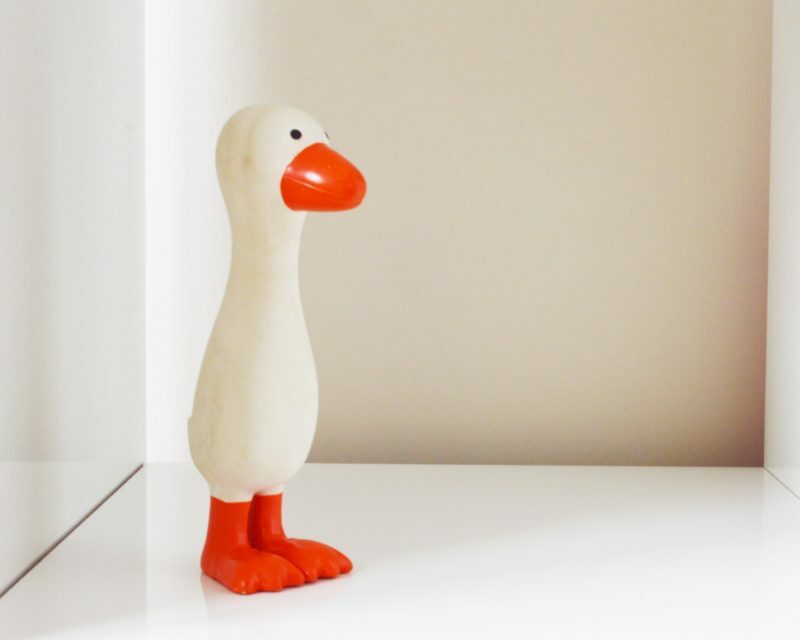 Gertie is a lovely toy for a baby and would make an ideal new baby gift, practical as well as being a rather cute goose to look at too! 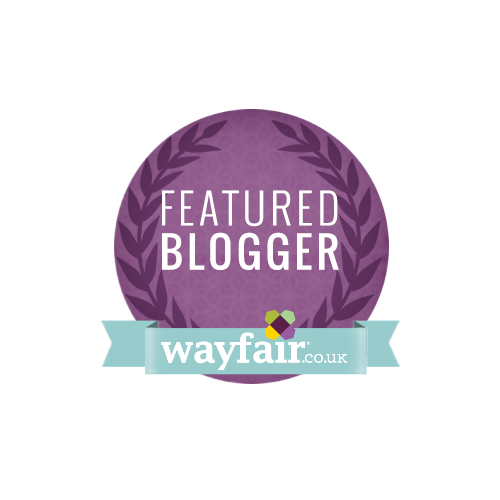 Disclosure: We were sent Gertie the Good Goose for the purpose of this review but all thoughts and opinions are my own.